Dedicated "to Laura," this book contains 75 new poems, most of which are titled "Poem." "Void of course" is a term from astrology referring to a time when the moon is in between zodiac signs. Projects begun with the moon "void of course" will either remain unfinished or fail to produce the desired results. Carroll was born under a void of course moon. This is the first book Carroll wrote using a computer. 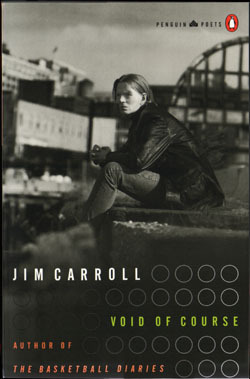 In the cover photograph, Carroll is sitting on the dock where the survivors of the Titanic landed. Laura, to whom the book is dedicated, designed the River Jordan broadside.